The message ends by telling visitors to “stand by for further announcements,” and the big announcement is here—the BBC reports that the project will go on, with a primary goal of breaking the current land-speed record of 763 mph. Entrepreneur Ian Warhurst now owns the project, and after deciding that it’s “commercially viable” to keep alive, the BBC reports that its engineers want to start on high-speed trials as soon as possible. That could mean as soon as later this year in the South African desert, but according to the BBC, the people on the project aren’t giving strict timelines for the relaunched project just yet. The car is now in a white-and-red livery instead of its old blue-and-orange one, and the BBC reports that the project will have a sort of “safety net” this time around—the less cash the project is able to raise, the more Warhurst, whose money comes from turbochargers, will put into it. 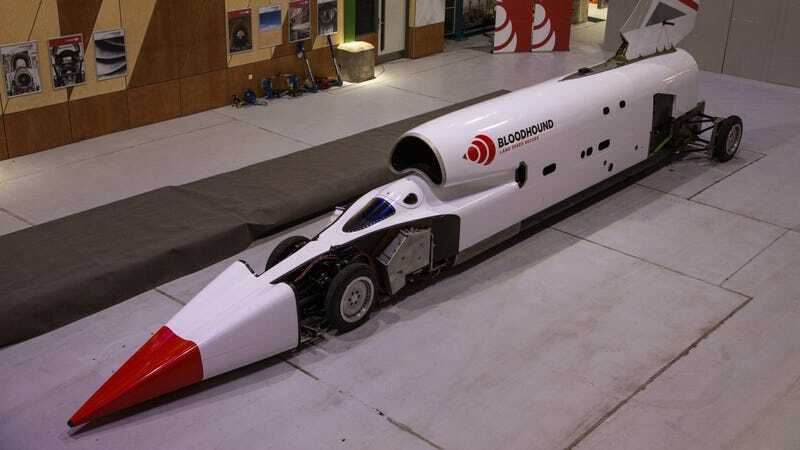 It’s understood Bloodhound will still pursue a sponsorship and partnership model, but Mr Warhurst will act as a kind of guarantor, ready to step in if cashflow faces a bottleneck. The project is, of course, about where it left off when the financial situation brought it to its temporary doom last year. The BBC reports that some body panels are missing, but other than that, the car will be ready soon enough. Goals for the car remain the same as well—beat the 763-mph land record that broke the sound barrier with the driver who last set it in 1997, and eventually, far surpass it with a run for 1,000 mph. But the BBC reports that the team’s now breaking it up into two distinct phases: the record, then the four digits. Reports about the Bloodhound’s financial troubles and administration came late last year, with word in October being that the project needed an extra 25 million pounds to keep going. It was already under administration by that time, and after not getting the investment it needed by December, the project was deemed dead and the car was up for sale in the $300,000 range. That same month, Warhurst swooped in to buy the whole thing and likely keep it going. The message on the Bloodhound website after the sale was cautious, saying the future of the project was “very promising” but not definite. It looks like there’s a definite answer now, though, and the answer is that the pursuit of a new land-speed record will live to race another day. Let’s hope the project sticks around long enough to make it happen this time around.